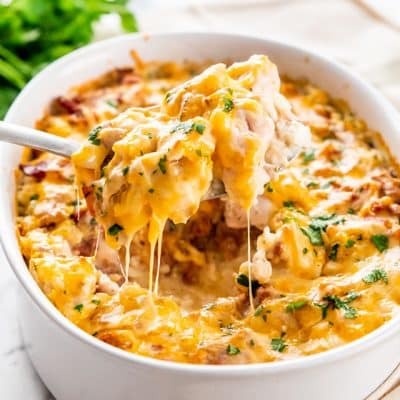 This Chicken Bacon Ranch Casserole is your answer to a busy weeknight dinner. 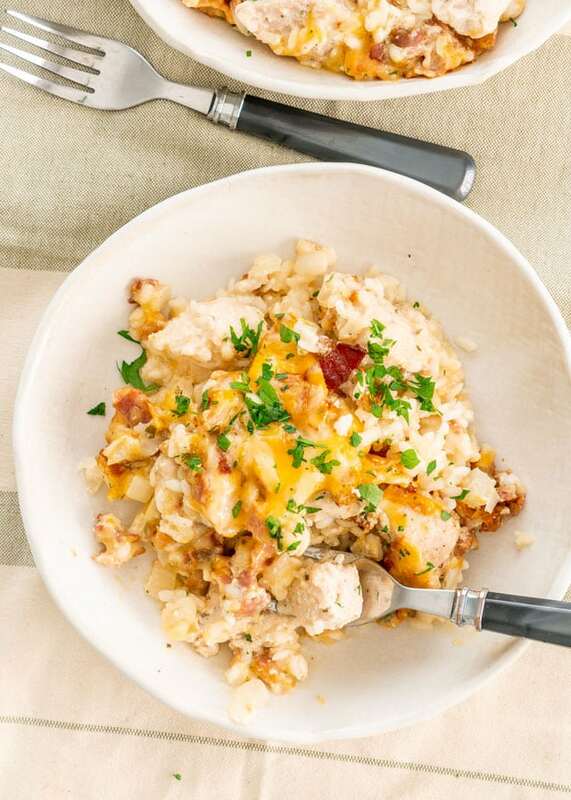 We’re talking creamy, cheesy rice casserole loaded with Ranch chicken and bacon! I have to admit that I love using ranch seasoning mix in cooking, I just love all the flavor it gives to my food, plus it makes for some really simple cooking. I’m all about simple cooking and this casserole dish checks all the boxes. 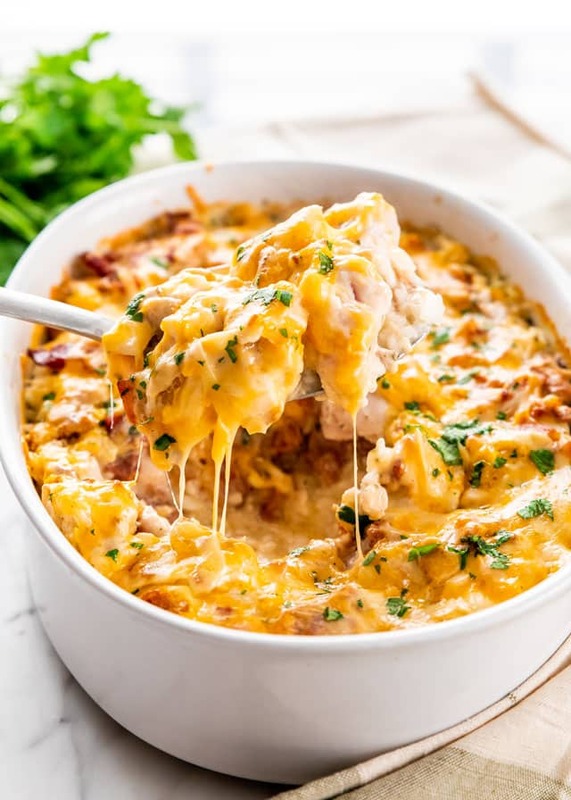 This chicken casserole is so simple anyone can really do it because all you really have to do is dump all the ingredients together in a casserole dish and bake. Anyone can do this. This chicken casserole is actually similar to the Crack Chicken Penne I posted a few weeks ago, as far as ingredients go. While that’s pasta based and it’s cooked on the stovetop, this casserole is rice based and baked in a casserole dish. The great thing about this casserole dish is that you can actually even add more veggies to it, like frozen broccoli, peas, green beans, whatever you prefer. 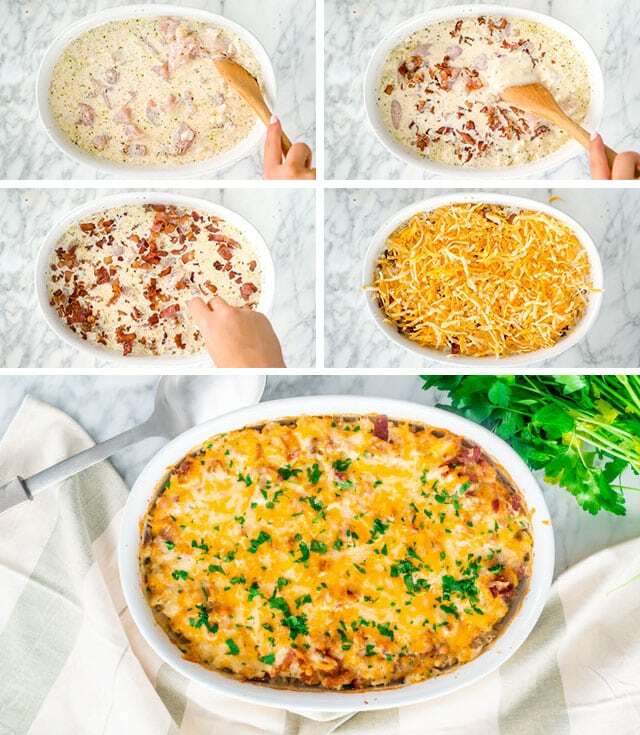 This Chicken Bacon Ranch Casserole is your answer to a busy weeknight dinner. 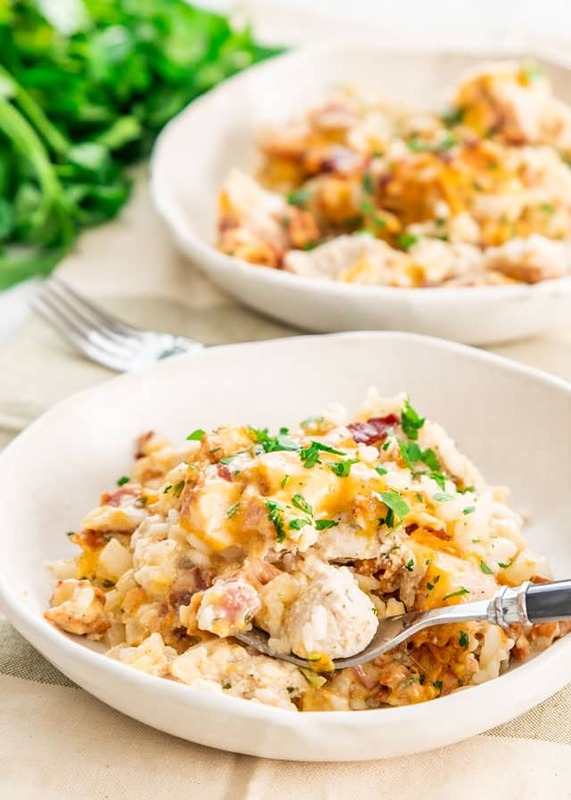 We're talking creamy, cheesy rice casserole loaded with Ranch chicken and bacon! In a medium size bowl toss the chicken together with the olive oil and 2 tbsp of the ranch seasoning mix; set aside. CHICKEN: I prefer chicken breast in this casserole dish, but boneless skinless thighs can be used as well. RICE: I prefer a short grain rice in this casserole because I like a stickier rice for a casserole dish, but a longer grain rice would work as well. Also brown rice can be used as well, but the cooking time would be a bit longer. 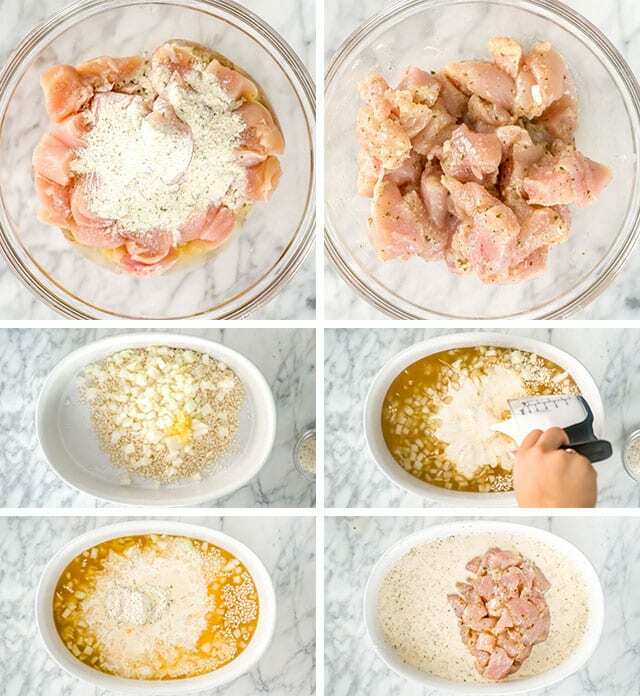 I am always looking for chicken recipies, so I can use up my rotisery chicken. I came across this one and it looked really good. I read the reviews before starting. I decided to get the short grain rice as the instructions stated. I also added mixed vegetables so it could be a complete meal with my salad. This casserole came out perfectly! I think the short grain rice was the ticket to perfection. 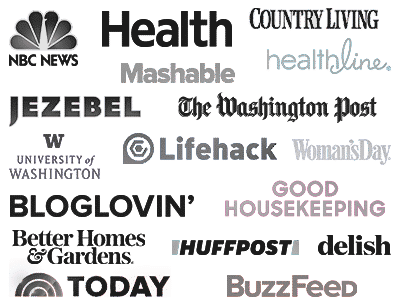 Thank you so much for your site and sharing. Hello Jo. Can this be made in a crockpot? If so, any adjustments needed to ingredient ratios? 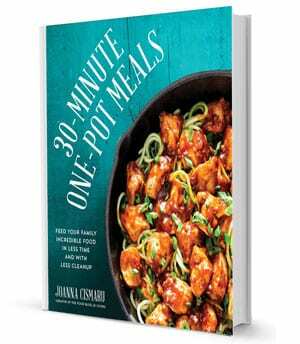 Do you know how long to cook and at what setting in a crockpot? You’ll definitely need less liquid- I would say 1/3 cup cream and 1 1/2 cups chicken stock. Try it out on high for 2-3 hours. Keep in mind that we have never tested this recipe in a crock pot, so this is an estimate that you can play with. Can you use something in place of the rice? Hi Angela! I would just mix the veggies in straight from the freezer. You’ve got it right, the chicken has plenty of time to cook fully in the oven! It’s a nice and easy throw-together type recipe. This was very good except one thing went semi wrong. The video shows the casserole as very creamy but mine was not. I used the exact amount of liquid. Could it have been the pan size? I used a 9×13 cake pan. The pan I used also is the same as a 9×13 baking dish. Perhaps it was the type of rice you used? Could you substitute pasta for the rice and keep everything else in the recipe the same? Also want to add chopped broccoli in it. You may need to adjust the liquid to suit whichever type of pasta you end up using! But that will work, and will be awesome. Broccoli is a great addition as well. Delicious and definitely easy but I’m confused: How does 1 lb of chicken and 1 1/2 cups (i.e., 3 cups cooked) feed 12 people? That’s 1.3 ounces of chicken and 1/4 cup of cooked rice per serving. Servings are just guidelines. The casserole overall once all ingredients have been added and cooked, should serve 8 to 12 people. However, feel free to change the serving sizes as desired. Had trouble with the rice. It never cooked through. What is the actual cook time ? Every oven is different, and the type of rice you use will make a difference too. This worked perfectly for us. You can add more liquid and/or cook it longer to get the desired doneness. Anxious to try this. Can I use 2 % milk instead of the half and half? Do you think if I used condensed milk or evaporated milk instead of heavy cream would work? I also do not have Ranch dry mix, could I use a little more Ranch dressing? Evaporated milk would be great. Yes you can use ranch dressing for sure. Can cauliflower rice be used instead? You can, but the recipe will have to be changed. The liquid in this recipe is used to cook the rice. Since your cauliflower rice won’t need as much liquid, you’ll have to use a lot more of it and less liquid. Use 4 cups of cauliflower rice and about 3/4 cup of the chicken broth. Bake for 30 minutes covered and 15 minutes uncovered. Can I freeze this then bake? You can! Just cover it up properly, then when you’re ready to bake it I would take it from the freezer and pop it in the oven directly, will take a bit longer to cook though. Can I mix this casserole ahead of time and put it in the fridge until I’m ready to bake it? I’m a bit confused. Does the recipe call for both pre-made ranch salad dressing, as well as the dry ranch seasoning mix??? No, it’s not the dressing you pot on salad, just the dry mix, but that’s what it’s called, if you click on the link in the ingredients list you’ll see which one it is on amazon. It’s just a dry mix. I stumbled upon your recipe and I knew I had to try it and I’ve now made it several times. It’s fantastic! My husband and I both love it!! I didn’t use low sodium chicken broth and with the bacon it was salty. We gobbled it right up though. Had second helpings . We always use low sodium products whenever possible, it will give you way more control over the salt content. We’re glad it was still a hit! Love all your recipes as a cook for decades I enjoy all your recipes. I. would truly love to make this, but there is only 2 of us. Even if I save it for when my son and grandson come over that is only 4. This recipe makes 12 servings. Any suggestions on how I can cut this recipe down to serve 4. Even without trying this recipe I rated it 5 Stars because I love all the ingredients in the recipe so it must be AWESOME!!!! If you hover your mouse cursor over the number of servings in the recipe card you’ll see a sliding bar appear. You can change the number of servings to suit what you’ll need. Enjoy! Although you can just estimate changing the recipe to feed less I just changed the serving size and got more accurate measurements. Awesome feature.